My first attempt. I don’t like the subsurface scattering I got on some of the candles. It looks almost blotchy. @ MAU-Y2K: Very nice job! I like the how the colors play out. And the materials are believable too. Some really good images coming in. Keep up the good work! dany_kurian - Welcome! That’s a good start. See if you can get softer shadows, and can get real reflections in the metal candle holders. The picture and frame texture aren’t really working here, if you can find something more fitting to the scene – maybe something iconic in India? Polyphemus - Hi! OK, you already listed things you are working on. I hope you can get an impression in the next version that light really comes from the candle flames. MAU-Y2K - Welcome! I like the refraction in the vase with flowers and water! Some of the petals and leaves could be made more translucent feeling if they had more bounce light and less dense shadows, some fill on the leaves in the top of the vase would help too. The candles are looking good, maybe near the top some of them go too bright, and maybe some of them could be a little more reflective. chrisstevens - Welcome, good start! 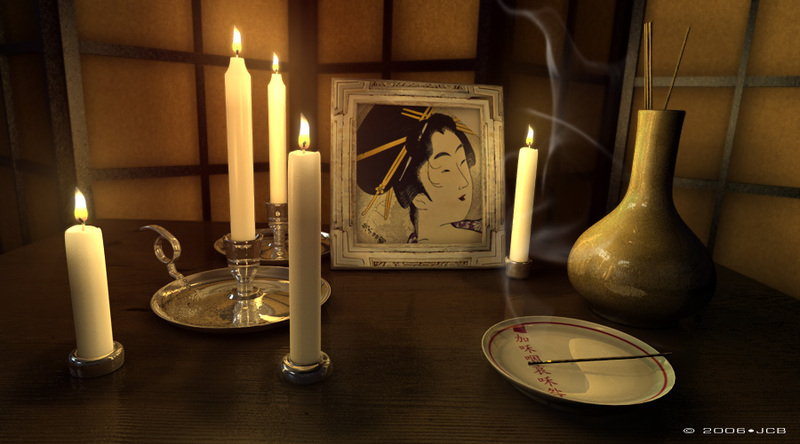 Try to work on softening the shadows and getting the candles to look like wax. saavedra - Good start. Work on the look of the candles and wax, but most of all try to get the impression that the light is coming from the candle flames. nverdon - Nice! The warm colors help build a look. The hard shadows could be softened, and the caustics by the vase could be more soft and convincing. slatr - OK, good start. Try to figure out why some of the candle holders are going black, and others are going white. Maybe you could fix the background behind the screen so it wasn’t pure white, also find a new picture to put in the frame? I was having trouble with my metal material. The small candles are different materials than the large ones, but I didn’t want the large ones to be black. I will work on that and the other two items tonight. ok, here is another revison. for the first revision I have already worked on the smoke and the heat ripples. Now I have added some light to the picture and the little mirror. 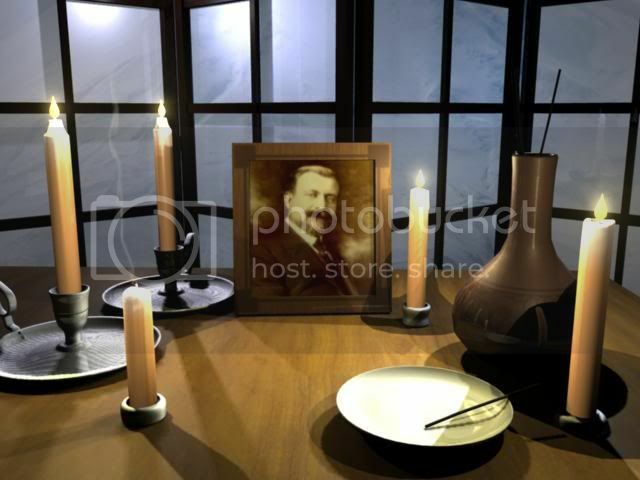 I also changed the backround, some textures and the adjusted the material for the candle holders. I hope you like it! nverdon, I really like your monochromatic look! It has a really warm feeling to it, and the reduced palette puts the emphasis on contrast and shapes. Hi all, this is my render made with C4D 9.6 + AR2. Many thanks jeremy for your analysis, you’re right. Just a new test, and new adjustments tomorrow. Wow so many great renders. This is my latest work in blender. Here is my image, with the improvements kindly suggested by Jeremy. Ahhh Silvia, that is gorgeous! You are really kind, slatr, thank you very much for the compliment! now you’re just showing off Great animation! Lazzhar - Yes, good idea ! your animation is very nice ! Silvia - Good work, very nice picture, I like it. The last picture. great challenge !